Food served in lettuce cups delights me for two reasons. One, it’s fun to eat. Two, it’s lighter than eating food served with carbs, so I can eat more of it. Salmon Skin San Choi Bow is my spin on a dish I had for first time when I lived in Melbourne, Australia. If you go, eat at the Supper Inn. It’s a family-run Chinese restaurant located in Melbourne’s Chinatown in the Central Business District (CBD). I’ve been eating there for over twenty years and the food is SOLID. San Choi Bow at the Supper Inn is sautéed chicken with Asian veggies served in lettuce cups with hoisin sauce. I’ve also seen it made with pork. I created this version as part of a dinner my food-obsessed friends and I made for a Christmas Eve 2013 with the theme “Feast of the Seven Fishes and a Hunk of Meat.” We are not religious, but we love a good theme. 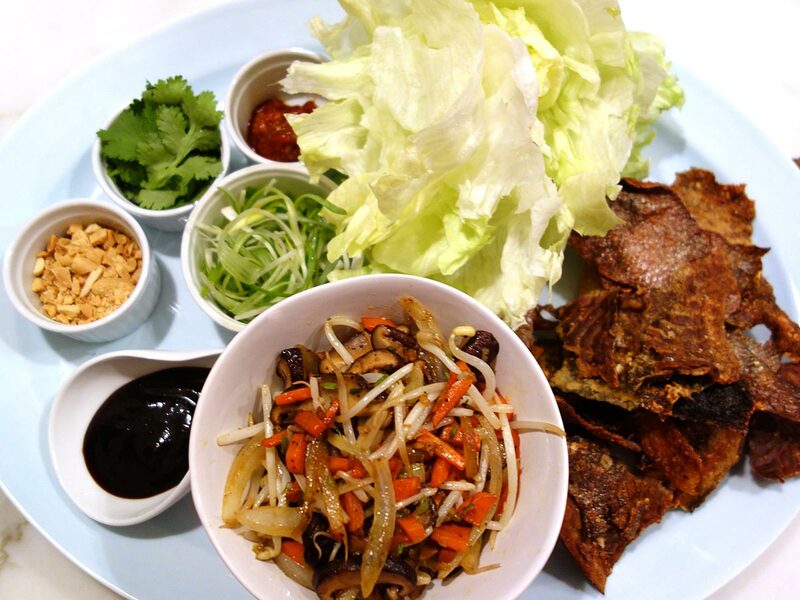 Crispy, crunchy salmon skin, atop gingery, garlicky fresh Chinese mushrooms, water chestnuts and bean sprouts in lettuce cups with all kinds of toppings to play with. Each time I’ve made San Choi Bow for dinner parties my guests always get a big kick out of it because they get to play with their food. It’s a way of bringing what’s fun about cooking to the table, and it becomes a delicious conversation piece. Salmon Skin San Choi Bow is perfect for gluten-free and pescatarian diners. If they leave off the salmon skin, vegetarians and vegans will love it too. It’s a real crowd-pleaser.